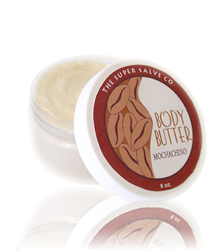 Smooth one of our Body Butters over entire body, preferably when your skin is warm & damp after bathing to lock in moisture. This delicious irresistible rich coffee chocolate moisturizer will entice your senses. Coffee bean butter has both sun protection & antioxidant benefits. Virgin coconut oil, shea butter, coffee bean butter, cocoa butter, mango butter, & vitamin E oil. 85% organic ingredients.